We covered a source for cheap visualist miscellany last week. It included cheap NTSC CMOS cameras, but unfortunately DealExtreme doesn’t seem to stock much PAL gear. I had gone looking and placed an order with another site, but didn’t want to recommend it until that order had arrived intact. That order has arrived intact. The source for these cameras is DHGate, which is a “marketplace” rather than a direct merchant. DHGate provide a database of products and act as an escrow for payment, it feels a little like eBay. Terms are set by the individual seller, so it’s not a free-shipping wonderland like DealExtreme, but the prices are still finger-tinglingly low. 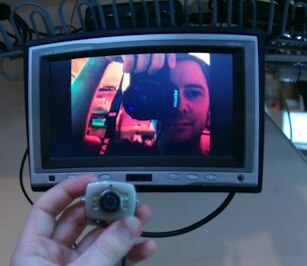 I ordered 16 of these little cameras, which seem to be the PAL version of the NTSC ones at DealExtreme. 16 cameras cost me US$219 including shipping ($13.70 each) and they arrived in about a week. I’ve unpacked and tested them, and they’re all working perfectly. 20M Video/Audio/Power Cable, or available as 10x10M bulk lot. BNC Cat5 Balun Pair – similar to the aforementioned S-Video ones, but about 1/5 the price. 100′ Cat5 Cable, to go with those baluns. Sony DV Camera S-Video + Composite Cable – these replace the standard output cable for Sony video cameras, allowing both S-Video and Composite output at the same time. Also works with my HVR-V1P. These resources won’t help in the afternoon-before-the-show mad rush, but if you’re planning for a tour or project then they can definitely help your budget stretch further. Sorry if these posts are costing some of you out there lots of time and/or money. We’re just trying to help! I’m sure I’ll be coming back to these posts next time I have gigs to organize, so if anyone else finds worthwhile sources please add them to the comments.